The Agrarian Adventure is the steward of a hoop house erected in 2006 at Tappan Middle School, with generous support of community members, and the Ann Arbor Farm and Garden Association. 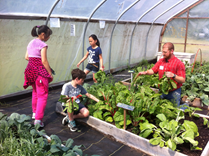 This hoop house has been utilized as a winter garden for students, a hub for seedling production and distribution, and as a growing site for students at Tappan (with particular leadership from those in the after school Food & Garden Club). Over the ten years since it was built, produce from the hoop house has found its way to classroom and outdoor tastings, school cafeterias, student-prepared meals, the homes of Tappan families and garden volunteers, fundraiser events, local businesses, the Backdoor Food Pantry, and Food Gatherers.